There are a lot of messages out there about the ‘extraordinary’. Especially in ‘the media’. It seems that we all, at times, feel pressured to be living extraordinary lives, on a permanent high of excitement and achievement, striving forever onwards and upwards. Chasing the rare and the precious. But do you know what is rare and precious? Noticing and being aware of the passage of time. Being in the moment. The million and one little ordinary things that happen each day that many people are currently missing. The truth is that most of us live, on the surface, ordinary lives. There I’ve said it. I mean this in comparison to these extraordinary lives that we are persuaded to chase. Or encouraged to chase. I mean no insult in this. You have to believe, I love the ordinary. It’s where the extraordinary really lives! On the surface my day has been pretty ‘ordinary’ by anyone’s standards. I got up, ate breakfast with my family, had a meeting with a client, wrote some stuff, planned a work project, made beans on toast, worked some more, wrote up some notes, picked the kiddo up, did the whole bedtime routine. And now about to have friends over for a simple dinner, them stack the dishwasher and go to bed. But you know what was within this? A rainstorm that stopped me in my tracks. A really delicious hot cup of tea just when I was flagging. Overhearing my son singing the wrong lyrics to a song, so sweet. The pleasure of walking into a tidy bedroom. Choosing the right mug for a late afternoon coffee. Picking some little flowers from my garden for the dinner table. The feeling of a small warm hand in mine. Granola. Don’t let these things pass you by. Instead of finding the weather inconvenient, embrace it. Fold laundry with care and love for the people who wear the clothes (try not to hug the children’s clothes too much when you do this!). Stop to look at that snail making his way across your garden path or yard and notice how beautiful his shell is (and try not to worry about the lupins). Linger over breakfast or dinner, however ordinary the food, to savour the taste and appreciate the company of anyone you are sharing that with. 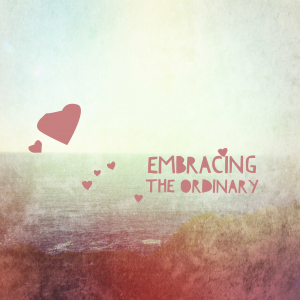 Embrace the ordinary. Then the extraordinary takes care of itself. This is a beautiful and observant article. It’s something that is very true in this society. I find that I have to keep reminding myself this, when I have media telling me otherwise day in and day out. I love the ordinary! Don’t get me wrong, I love extraordinary things too. But how cool is it to find a couple of ordinary gems in your day. Every day?! I really enjoyed this post. My life often feels very small and quite ordinary and I try to spot the moments each day that are beautiful and make me happy, even if they’re fleeting sometimes. Thanks for the reminder that it’s these ordinary moments that are the most important :).